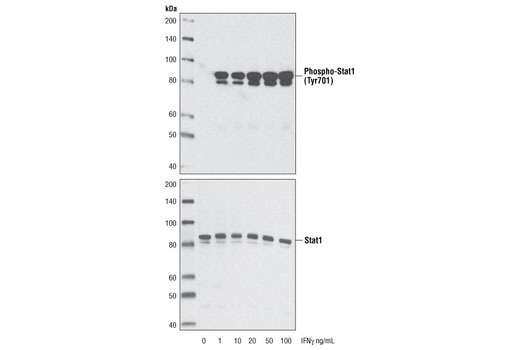 Western blot analysis of extracts from HeLa cells, untreated or treated with various concentrations of Human Interferon-γ, using Phospho-Stat1 (Tyr701) (58D6) Rabbit mAb #9167 (upper) or with total Stat1 Antibody #9172 (lower). Recombinant human IFN-γ was expressed in E. coli and lyophilized in 10mM Sodium Phosphate buffer pH 7.4. Purity was greater than 95% as determined by RP-HPLC and SDS-PAGE. Specific activity as determined by a viral resistance assay was less than 0.05 ng/ml. Working concentration generally ranges from 10-50 ng/ml. Lyophilized product is very stable at -20°C. It is recommended to reconstitute with sterile water at a concentration ranging from 0.1 to 1 mg/ml which can be further diluted in aqueous solutions as needed. It is recommended to add carrier protein (0.1% HSA or BSA) for long term storage. Interferons (IFNs) appear both locally and systematically early after viral infection and participate in limiting the spread of infection. They also affect cell differentiation, growth, surface antigen expression and immunoregulation (1). There are three naturally occurring interferons: α, β and γ. IFN-α is derived from lymphoblastic tissue and has a number of therapeutic applications in the treatment of various human cancers and diseases of viral origin. Recombinant IFN-α from both natural and synthetic genes binds to a common cell surface receptor and induces antiviral activity in a variety of cell lines. When binding to discrete cell surface receptors on target cells, IFN-α induces rapid changes in Jak/Stat phosphorylation, which initiates the Jak/Stat signaling pathway (2). IFN-α signaling also involves production of DAG without an increased intracellular free calcium concentration and the subsequent activation of calcium-independent isoforms of PKC (β and ε) (3). All IFN-α signaling pathways lead to final alterations of gene expression, which mediate their pleiotropic biologic activities. IFN-γ, also known as type II interferon, is produced mainly in activated T lymphocytes and natural killer cells (4) and has broad effects on various cells of the immune system. Synthesis of IFN-γ is induced by many signaling proteins including IL-2, FGF, and EGF. Stiehm, E.R. et al. (1982) Ann Intern Med 96, 80-93. Pellegrini, S. et al. (1989) Mol Cell Biol 9, 4605-12. Pfeffer, L.M. and Colamonici, O.R. (1991) Pharmacol Ther 52, 149-57. Young, H.A. and Hardy, K.J. (1995) J Leukoc Biol 58, 373-81.